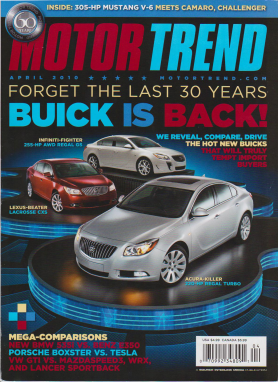 The last time Buick had graced the cover of Motor Trend magazine was way back in August of 1982, with the release of the Century T-Type. 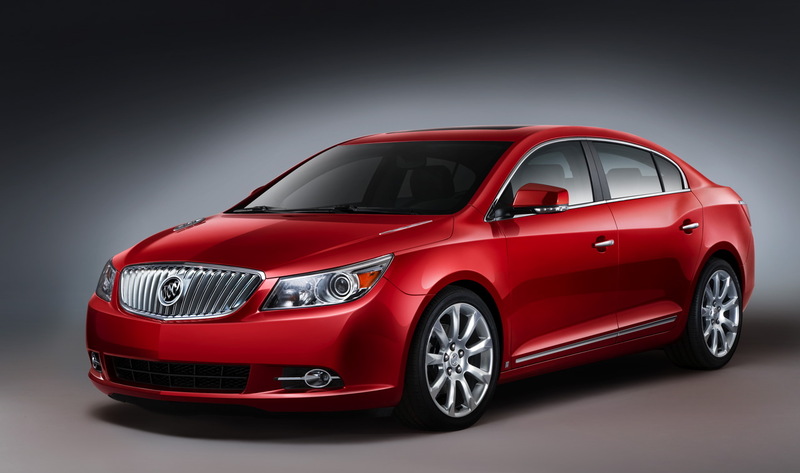 We couldn’t be happier to see that Buick is now getting the recognition is properly deserves while it transforms itself from “grandpa’s car” into a modern, premium brand. That revolution started with the release of the Enclave a couple years back, and continued with the release of the LaCrosse luxury sedan last year, and now with the release of the Regal sport sedan this year. I’ll be the first to admit that before the transformation, Buick was stale – I, being in my early twenties, would never have considered buying a Buick. The last model that appealed to me would have been the late-80’s GNX, of which you’ll find about 400 examples nation wide, and was more of an anomaly for Buick than a stepping stone. The cars of the 90’s and into the 2000’s were made and marketed for the older generation, with no regard for young buyers in mind. The Enclave was really the first step Buick took to become proactive in looking for customers in a new demographic – sure it’s still got the luxury and ride to appeal to the older generation, but take one look at it and you can’t tell me it wouldn’t fit right in in the garage of a young family. The LaCrosse came next, and that really got everyone thinking about the new direction this brand was heading in – like the Enclave it still had all the amenities you would want out of the Buick, but in a much, much more appealing (for me, anyway) package. Not to mention the slew of technological options inside – ie stereo, navigation, flip up rear DVD screens – that could be had. Lastly, and finally, came the Regal this year. After generating buzz at auto shows with its new styling and flair, dealers started getting their first shipments of the new sport sedan in spring of this year. In his review of the 2011 Regal, Motor Trend Editor-in-Chief Angus Mackenzie says the Regal “is the first Buick in history with internationally chic sheetmetal and sophisticated road manners to match,” and that it “is truly likely to appeal to young, affluent, trend-setting import buyers.” I couldn’t agree with him more – I’ve never looked at a Buick the way I look at the Regal, and a couple years ago when we were selling Centurys and Park Avenues (great cars in their own right, just not my style) I would have never imagined a Buick being compared to a Lexus or Audi the way the Regal and LaCrosse have been. This coming year we are expecting to see the Regal GS – although it hasn’t been officially announced by GM – and I can’t wait to see the buzz around that car. 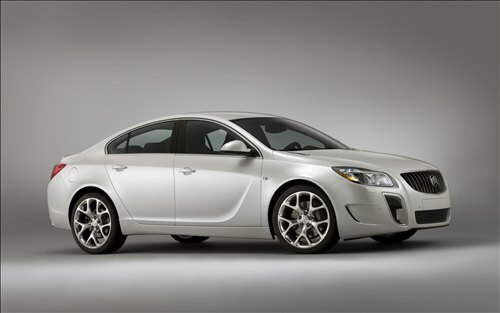 A Buick AWD sport sedan with a turbo and 6-speed stick you say? Sign me up. The latest word we’ve got has been hinting at a small premium car, as well as a small cross-over in the coming years – I say if they keep up the work they’ve done with their last few models, keep ’em coming! 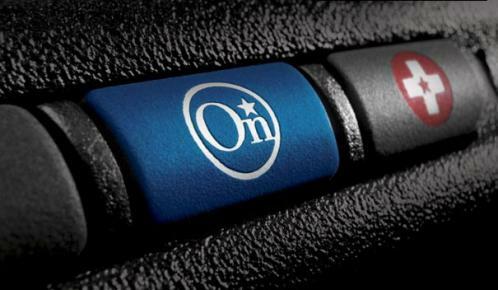 OnStar was officially launched at the Chicago Auto Show in 1995, celebrating its 15th year in operation here in 2010. In that time it has helped millions of people find directions, unlock their doors, and get help in an emergency – but it’s not ready to sit back on its heels just yet. With the ever advancing Ford Sync system, GM is looking to improve OnStar in a few key areas. Recently released info tells us that OnStar is currently testing a few new features that it will roll out in the near future – including voice texting (something Sync does very well) and the ability to update your Facebook status by speaking. More than one million responses to Emergency Service alerts, assisting drivers, first responders and local police departments in many life-threatening situations. More than 146,000 responses to Automatic Crash Notifications where OnStar sent emergency personnel to a vehicle whose driver was unresponsive after an airbag deployment. 198 different coastal communities helped with hurricane preparedness through OnStar’s Crisis Assist. More than 59 million Turn-by-Turn routes delivered. What was seen as a preliminary step against distracted driving, Turn-by-Turn Navigation allows an advisor to send directions directly to a subscriber’s Driver Information Center or radio. More than 4.7 million doors have been unlocked by OnStar’s Remote Door Unlock service. OnStar unlocks 1,833 doors every day, a huge convenience for people who accidently lock their keys in the car. More than 147 million monthly e-mails have been sent to subscribers since launch, giving them real-time diagnostic reports of their vehicles. Luckily I haven’t personally had to use any of the emergency features or stolen vehicle run down on my own OnStar system, but I can attest to the ease of the Turn-by-Turn system, and the monthly diagnostic reports provide some great insight into the major mechanical systems in your car that you would otherwise need to go to the service department to get. The biggest (and most helpful for me, unfortunately) feature is the Remote Door Unlock system, when you lock your keys in your car you simply call OnStar and after a few security questions, they unlock the doors for you. If you’d like a full rundown of the many features of OnStar, visit our blog post from a few months ago here. So Happy Birthday to OnStar! It has been a great 15 years, and we can’t wait to see whats to come in the next 15.